about us - RAMGraphix, Inc.
RAMGraphix: “Your One Stop Graphics Shop” – For all Your printing needs! If traveling from out of town, take Highway 75 North or South to Plano, Texas. Exit Parker Road and Drive West. We are on the NORTH WEST corner of Alma and Parker Rd. 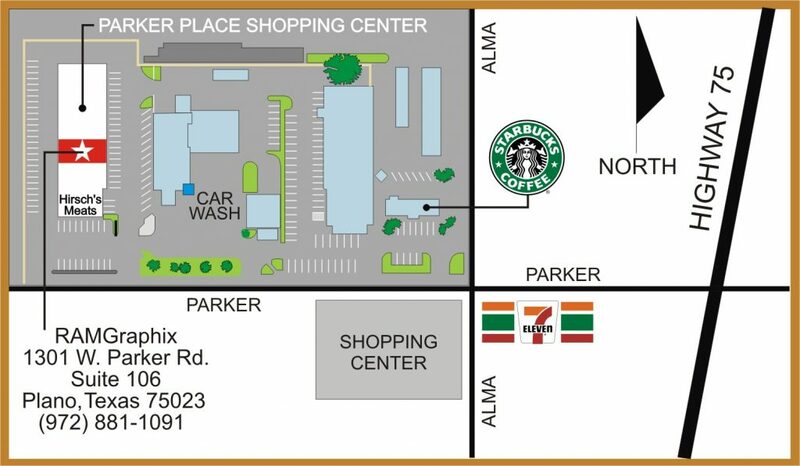 After you pass Starbucks Coffee House and the Car Wash, we are in The Parker Place Shopping Center just behind Hirsch’s Meats in Suite 106. Our Shop opens at 10:00 am. We are Closed on Saturday, Sunday and Monday.